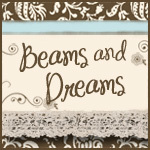 I'm participating in a fun blog party on Decor Chick. Of course, my molding trouble, um, projects are not yet finished, but I do love seeing what other are doing! If youlove the lok of moldings as much as I do, take a few mnutes to check out some of the amazing projects others have tackled!